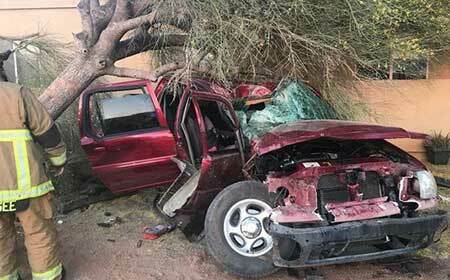 Apache Junction, Arizona—Five people were injured when their pickup truck smashed into a tree in Apache Junction on Thursday evening. The accident occurred at Apache Trail and Thunderbird Drive. No other vehicles were involved. One person was ejected, two people were seriously injured and two others in the truck sustained minor injuries. The three more seriously injured persons where transported to a nearby hospital. The truck was demolished. Accident investigators have not released the identities of those involved as the investigation continues. No additional information presently is available. We wish swift and full recoveries for all those who were injured.